It pains me to say this, but this blog will be temporarily paused for a little while. This is because I have the most delightful three month old baby to look after! He's been a long time coming and it turns out that babies really do require 24 hour care (who's have thought it!). This means I have barely any time to myself, let alone to write comic reviews. I will be returning to this blog in the future,but I may change the way I write the posts so that I can feel enthused about doing them. 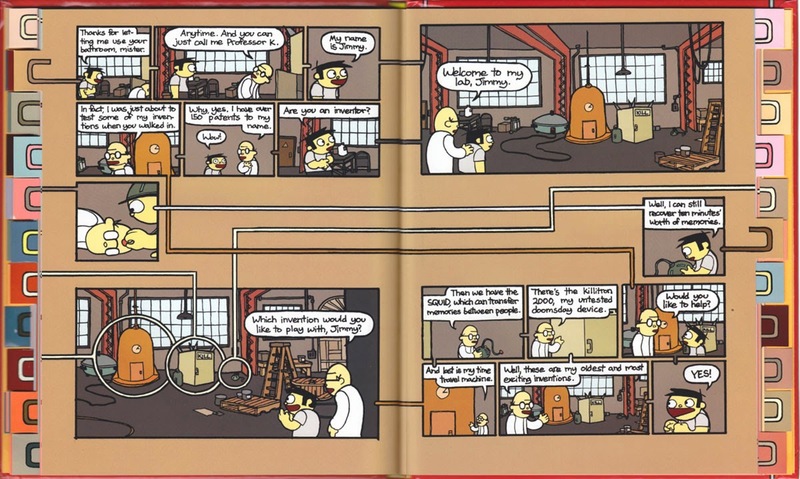 The book uses a series of lines and tabs to guide you through the adventure, starting with a choice of vanilla or chocolate ice cream that will lead you through to a variety of different scenarios, some surreal, some not. Amazon lists it as part of the top 10 graphic novels for teens, but this I disagree with. It's more suitable for an 8 year old. It's beautifully presented with lovely glossy paper, is available in hardback, and feels like a nice present. Shiga has a website where you can read his webcomics (mature readers only). I have real difficulty with these sorts of books, I prefer a structured narrative and being led through the story, hence the lack of a real review. Instead I skimmed through it and can see that it is imaginative and ideal for kids who do like these things. It has received praise from people I respect, so I am happy to recommend it. We've posted a guide to DC's continuity changing events so I think a guide to Marvel's big events is well overdue. Marvel's big events aren't about cleaning up storylines or changing continuity, but more about the spectacle, the event itself. They have a major impact in the Marvel Universe, but they don't necessarily change history (unless the event is specifically about time travel, or changes in reality). We won't list every single event Marvel has done, but we'll go through the ones that have had the most impact on the current universe. We'll also include things that aren't necessarily events but are quite important in Marvel's history. We'll put a logo next to each book denoting the main character or team that the event or storyline deals with. The titles of each event will link through to the book's Amazon listing (where possible). You could also buy them digitally from Marvel Unlimited, where you can buy individual issues or a year's subscription and get access to their entire digital archive. Or you can buy the books from a comic shop - we have a list of recommended shops here. If you are confused by any of the jargon in this post please have a look at our glossary. 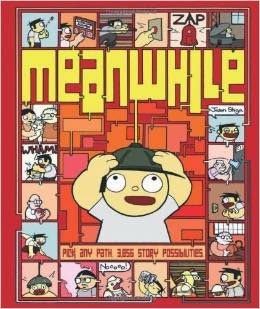 A comics site called Women Write About Comics (WWAC) has recently written about five comics on the theme of immigration. It's quite a political post as it's written with the UK General Election (7th May) in mind, but don't be put off by that as the suggestions given are really rather good. One of them is Anya's Ghost that we reviewed here, another is the current Ms Marvel series, published by Marvel Comics, which is excellent. There are also webcomics listed. I highly recommend you check out the WWAC site as well as the above linked article. 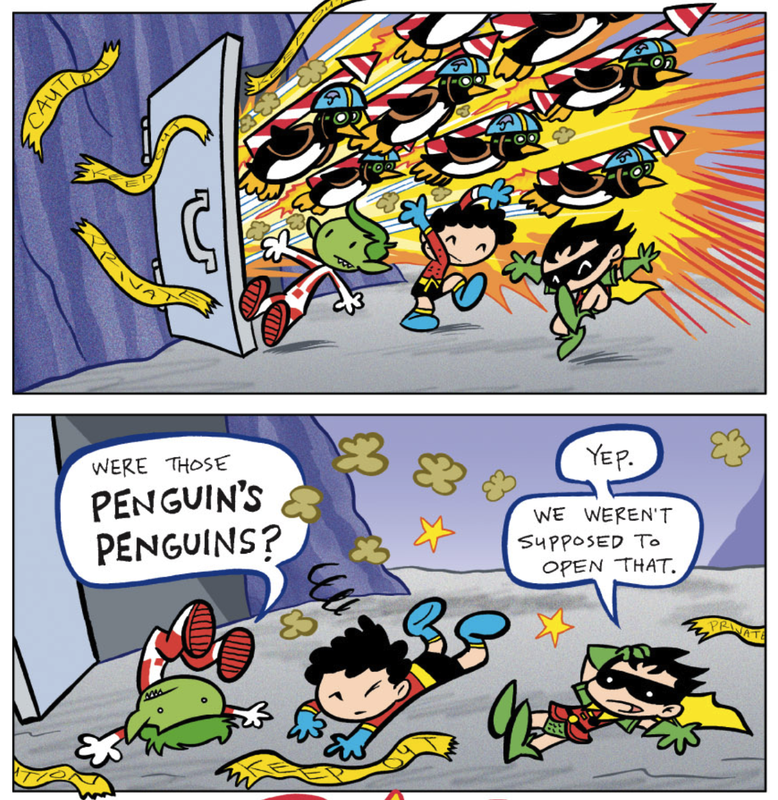 The Tiny Titans series is written for kids aged, at a guess, 5 to 10 years. 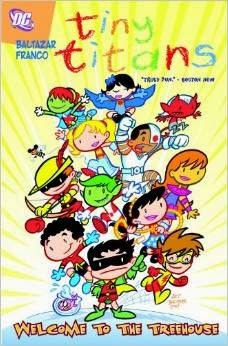 The Titans of the title are the Teen Titans, but aged about 7 or 8, attending primary (elementary) school. They don't solve crime or fight monsters - they go to classes, get the bus to school, hang out together at lunch and tease each other. It might sound mundane, but if you are 7 that's what your life is. These stories have superheroes doing the same thing. The teachers are villains from the DCU but there's no nastiness here. It's light hearted and it's adorable. 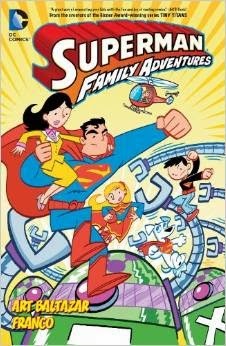 This is a kids comic centred around the Superman family. 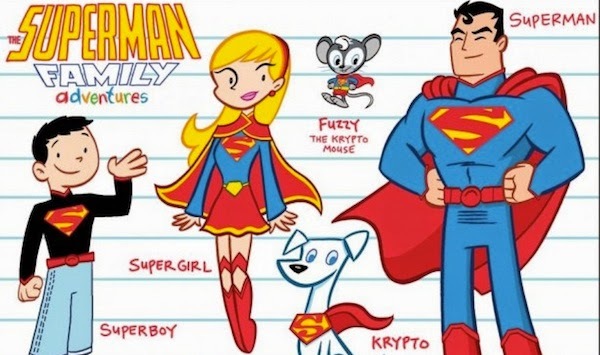 We have ol' Supes himself, Supergirl, Superboy, Lois Lane, Krypto the superdog, Perry White, Jimmy Olsen, Streaky the supercat, Ma and Pa Kent, and all the villains. Each story is between 1 and 12 pages and a whole variety of events are covered: Lex Luthor tries to take over metropolis with a robot army; Bizarro (the anti Superman) visits for ice cream; the superpets get a new member; Chief Perry White wants his coffee; Lois nearly works out Clark's secret. 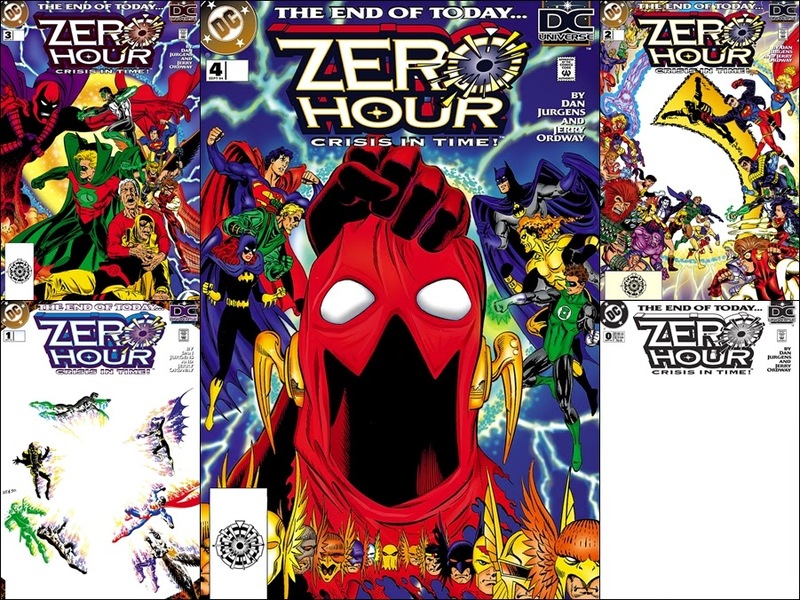 Zero Hour is a 5 issue mini series published by DC comics in 1994, which was billed as a sequel to their 1986 Crisis on Infinite Earths maxi series. You can read more about the crisis stories here. In Zero Hour, time is ending. Entropy is creeping back from the end of history to the present day and if the heroes don't do something soon the universe as we know it will be destroyed. Alternate versions of our familiar heroes pop up - many Batmen, lots of Hawkmen (see the page on the right) and a walking Batgirl (this story takes place after Barbara Gordon is shot by the Joker and paralysed). Our heroes realise something is terribly wrong and gather together to form a plan. A being called Extant seems to be responsible. Working with other mysterious figures he does his best to stop the superheroes, who of course respond with force - yet in the end it's simple human bonds and shared history which could save the day.